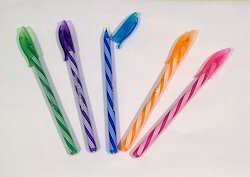 With the assistance of skilled and dedicated professionals we manufacture and supply wide array of Spiral Disposable Pens. Our products are available in different colors and sizes and are widely demanded in residential and corporate organizations. They have sleek in designs and are acclaimed for smooth flow of writing. Leading Supplier and Manufacturer from Mumbai, our product range includes Plastic Ball Pens such as Stick Polo Ball Pen and Plastic Ball Point Pens. Highly appreciated by the clients for their high tolerance, dimensional accuracy, light weight. We offer an extensive range of direct filling ball pen which are widely appreciated by the customers. Our range of direct filling ball pen are available in different styles, vibrant colors, fancy look and plain patterns. We use qualitative lead and are made from hard and soft plastic. 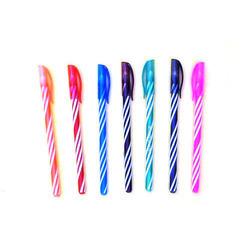 Our company has gained name and fame in presenting Colored Spiral Plastic Ball Pens. Buyers from U.P, Himachal Pradesh, Uttarakhand, Rajasthan, Punjab, Haryana & Jammu & Kashmir only will be preffered.